New Delhi, Nov, 2014: Whether you are driving your car for work or preparing for an adventure cycle tour on a rocky mountain or yet still hoping to floor your audience with your style quotient at a pool party, Maui Jim’s latest offering Seven Pools is an accessory you will love to flaunt. A versatile style that can carry all kinds of activities with élan, Seven Pools is inspired by the pools of ‘Ohe’o Gulch’, a scenic destination that offers beautiful, picturesque settings of waterfalls in the Hawaiian islands of Maui. This sunglass provides powerful polarized protection and extraordinary color enhancement to help you see the world like never before. It is a lightweight, high performance sunglass that is scratch and impact resistant and fit for any activity – be it adventure or everyday routine. Seven Pools’ lightweight frame offers an extremely comfortable wrap, making the accessory become a part of you and provides ultimate protection against the sun’s harmful rays with crisp optics and a vibrant view of the world. With its modified rectangle shape, Seven Pools best compliments round, oval and heart shaped faces. “We realize that people look for comfort, protection and style in whatever they wear and do. Seven Pools is a highly stylish and comfortable design that is set to appeal to a wide variety of audience. It is sleek and elegant; at the same time it offers wonderful comfort and flexibility in undertaking a wide range of activities -- from playing a high octane sport to the everyday routine of driving or jogging. Like Maui Jim sunglasses the polarized lens technology offers wholesome protection to eyes against harmful UV radiation,” says Mr. I Rahumathullah, Managing Director, Maui Jim, India. Seven Pools is available in Neutral Grey, HCL Bronze, Maui HT™, Maui Rose lens hues. The waterproof and oleophobic coating sheds water and snow and repels grease and smudge. 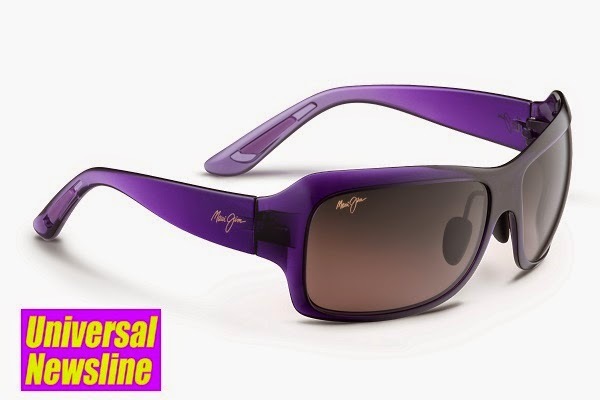 Like all other Maui Jim sunglasses, Seven Pools too comes with the patented PolarizedPlus2® color-infused lens technology technology that wipes out 99.9% of glare, 100% of harmful UV and boosts color via specially designed lens treatments. So your view is clearer, with crisper contrast and amazing brilliance. Maui Jim sunglasses have been awarded the Seal of Recommendation from The Skin Cancer Foundation as an effective UV filter for the eyes and surrounding skin.